Wikipedia gives a solid starting point for explaining crowdfunding … the collection of finance to sustain an initiative from a large pool of backers, the “crowd”, usually made online by means of a web platform. The initiative is generally to support a commercial enterprise (e.g. to create and sell a new product) but it could also be a nonprofit campaign (e.g. to raise funds for a school or social service organization), or a philanthropic campaign (e.g. for emergency funds for an ill person or to produce an emerging artist). The key to crowdfunding is that people who back projects are offered tangible rewards in exchange for their pledges. There are different models now in operation but it started on basis that only when the full target amount is raised, that all pledges are called in. There is no legislation or regulations in Ireland which specifically deals with Crowdfunding. The financial regulation legislation in place is designed to regulate other business models. Therefore, Crowdfunding platforms need to ensure that they do not inadvertently provide a service which is regulated as part of legislation regulating, inter alia, investment services, banking business and / or payment services. Crowdfunding is an option that entrepreneurs are increasingly looking at particularly where the investment is around €50,000. [If you think about it €20,000 can do a lot in business but can be very difficult to source when you have limited track record]. My experience is that some startups are reluctant to apply for bank funding on the basis that they believe they are not going to secure the money and the promoters are also wary of the personal guarantees required. I recently reviewed the availability of Venture finance in Ireland. A key point of that post is that accessing venture finance is not easy as it is a very competitive space – at a recent Startup Galway event Delta VC said that they review upwards of 400 business plans every year to invest in 8 to 12 companies. The big Crowdfunding players are US based. Kickstarter was established in 2009 and I remember it hitting the headlines when a guy called Scott Wilson looking to raise $15,000 funding convinced 13,512 people to pledge money to develop an iPod Nano Watch – raising $941,718 within 30 days.KickStarter does not currently accept Irish based projects so you would need to use a UK address (this is expected to change soon). To date over €1 bn has been contributed to over 60,000 Kickstarter projects. According to their daily updated stats page, most successfully funded projects raise less than $10,000. Olive decided to go with Indiegogo. Their model is based on a set percentage fee if you meet your target and a higher rate if you don’t but you get the money in any event. Seedrs is a UK company who are spearheading an equity based crowdfunding model – looks like a very credible team building this offering. The first crowdfund organisation that I became aware of in Ireland was FundIt.ie … apparently they are going strongly. Linked Finance is not in the crowdfunding space, rather the crowdsourced finance market in Ireland – they describe themselves as an alternative to bank finance. The model is based on businesses sourcing loan finance from borrowers registered with the site. I know several entrepreneurs who have tried but failed at Crowdfunding. It requires a lot of planning and an understanding of what is required to succeed. James McBennett wrote this compelling article of his successful KickStarter experiences and what he learned – based in Dublin even if article seems UK based. Equity crowdfuding is also gaining momentum – Dublin based Sian’s Plan, the online meal planner that guarantees healthy eating, raised over £100,000 on Seedrs – where individuals pledge funds to innovative growth-focused businesses in return for equity in that business. Google is full of great advice on ‘what you should do to win at crowdfunding’ and there is even a website/app that predicts the odds of your project reaching its funding goals.. The consensus seems to be that in addition to raising much needed funds that crowdfunding is good for engaging with the market; market testing; and refining your message. I know of several entrepreneurs who would now seriously look at Crowdfunding. I congratulate Trinity for developing a crowdfunding portal to support their entrepreneurs. I had heard about Gail Condon of Writing for Tiny previously and I wish her the best with her project (check out the really great video). My next crowdfund contribution will be to get my hands on a Tipperz – a superb product developed by Cloudy Star Ltd – I understand that David and Michael (based in Limerick) are poised to launch a KickStarter campaign this Wednesday (23rd April 2014) as their App has just been approved by Apple [TipperZ easily transforms the worlds most common pens and pencils into touchpens to be used on all captive touchscreen devices and it comes with a cool FREE to Download iOS/Android Games App]. So do you agree with final conclusion of the Matheson document …. European Union, and elsewhere, it would be timely for the EU Commission to propose legislation specific to this sector. 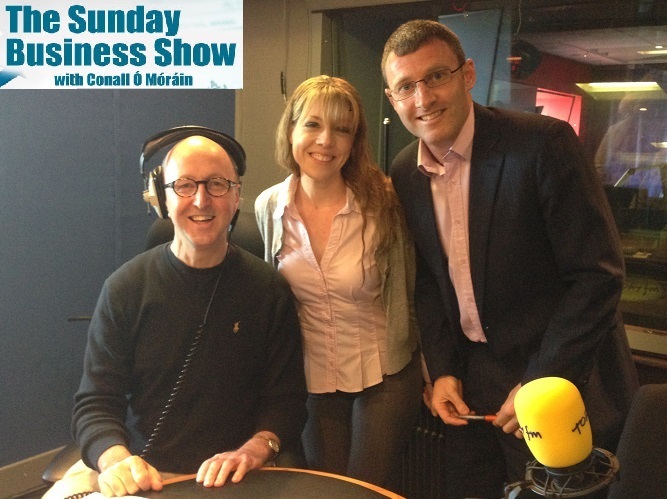 As always I hope you enjoyed this post … Thanks to Conall O’Morain and his team for inviting Olive and I to talk to Today FM Sunday Business Show listeners. It was a very enjoyable experience.